2 From your text page 6-15: A few comments should be made here about the selection of the y=0 position. Gravitational potential energy is a relative quantity, always measured with respect to some arbitrary position where y=0. In most cases, it does not matter where y=0 is chosen, but it is usually easiest to choose y=0 at the lowest possible position in the diagram (for example at floor level). This ensures that all y-values and all gravitational potential energies will be positive (or zero) and will be easy to work with. 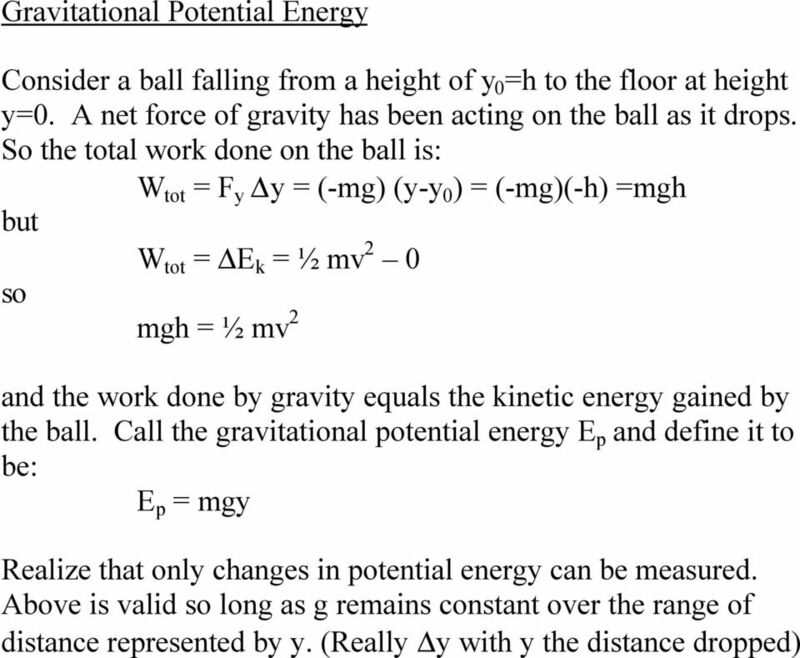 We shall see that what is usually important is the change in the gravitational potential energy, which does not depend on where we have chosen y=0. 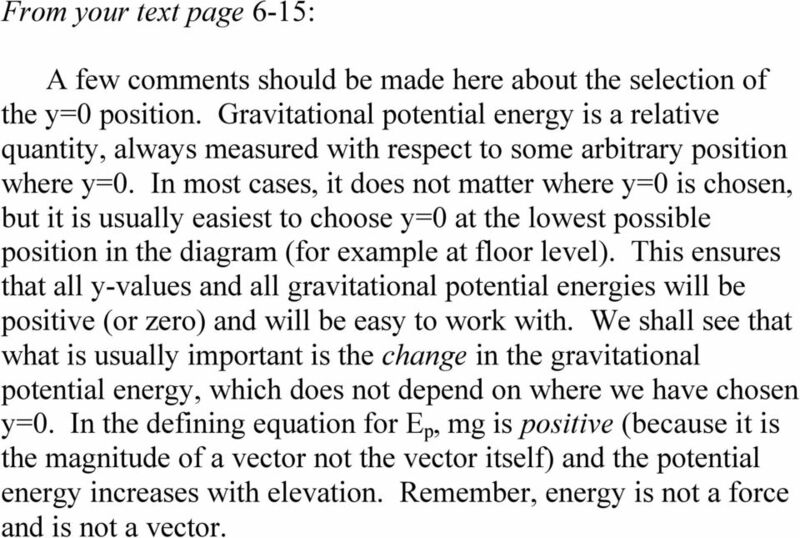 In the defining equation for E p, mg is positive (because it is the magnitude of a vector not the vector itself) and the potential energy increases with elevation. Remember, energy is not a force and is not a vector. 3 Conservation of Energy Energy can be converted into different forms but it can be neither created nor destroyed. When you burn a log to create heat, you are changing chemical energy into heat energy. 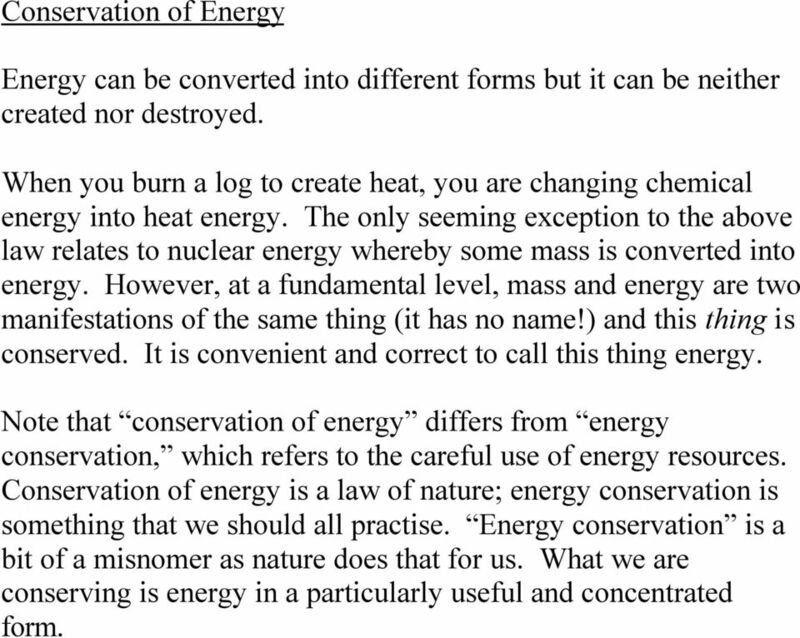 The only seeming exception to the above law relates to nuclear energy whereby some mass is converted into energy. However, at a fundamental level, mass and energy are two manifestations of the same thing (it has no name!) and this thing is conserved. It is convenient and correct to call this thing energy. Note that conservation of energy differs from energy conservation, which refers to the careful use of energy resources. Conservation of energy is a law of nature; energy conservation is something that we should all practise. Energy conservation is a bit of a misnomer as nature does that for us. What we are conserving is energy in a particularly useful and concentrated form. 5 Work done by Friction The work done by friction is the kinetic friction force multiplied by the distance moved. This work always produces heat or thermal energy. 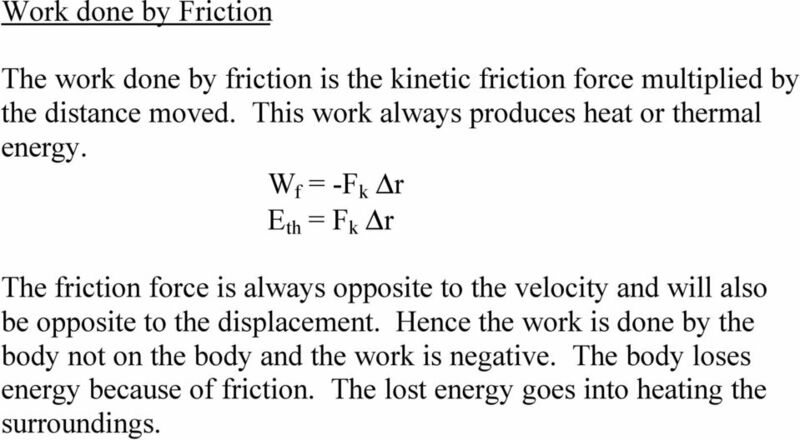 W f = -F k r E th = F k r The friction force is always opposite to the velocity and will also be opposite to the displacement. Hence the work is done by the body not on the body and the work is negative. The body loses energy because of friction. The lost energy goes into heating the surroundings. 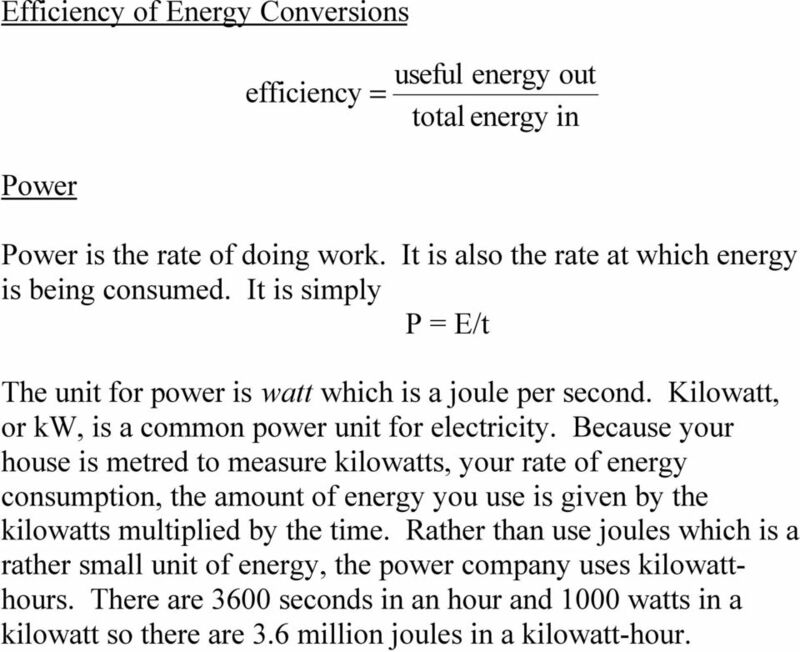 6 Efficiency of Energy Conversions efficiency = useful energy out total energy in Power Power is the rate of doing work. It is also the rate at which energy is being consumed. 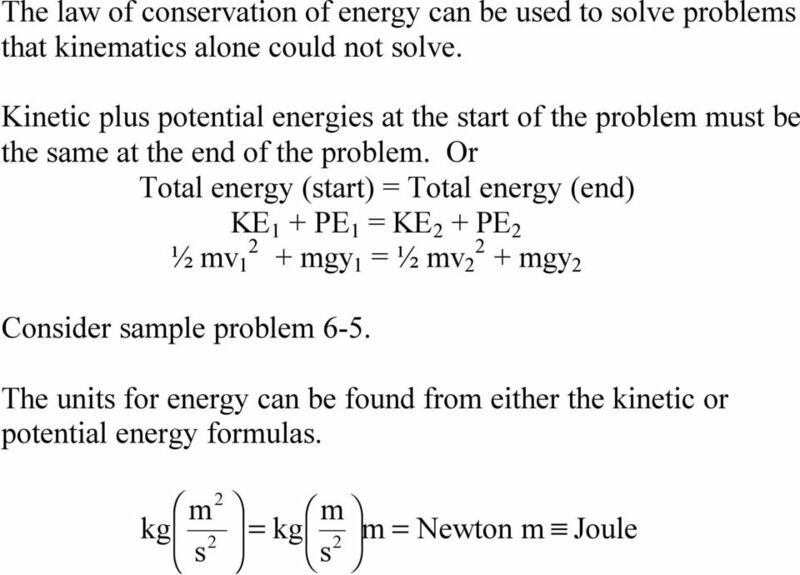 It is simply P = E/t The unit for power is watt which is a joule per second. Kilowatt, or kw, is a common power unit for electricity. Because your house is metred to measure kilowatts, your rate of energy consumption, the amount of energy you use is given by the kilowatts multiplied by the time. Rather than use joules which is a rather small unit of energy, the power company uses kilowatthours. There are 3600 seconds in an hour and 1000 watts in a kilowatt so there are 3.6 million joules in a kilowatt-hour. 8 You recognize this as v x = v 0x + a x t Note that the dimensions of Force time is Newton-second. The dimensions of momentum are mass velocity or kg m/s. But a Newton-second is a: m m kg s kg s 2 = s and we get the same either way as we must. Forces involved in collisions are usually very large. Consider a baseball bat striking a ball, as in sample problem 7-1. Activity 5a Potential and Kinetic Energy PHYS 010. To investigate the relationship between potential energy and kinetic energy. Name: Date: Partners: Purpose: To investigate the relationship between potential energy and kinetic energy. Materials: 1. Super-balls, or hard bouncy rubber balls. Metre stick and tape 3. calculator 4. Work Energy & Power. September 2000 Number 05. 1. Work If a force acts on a body and causes it to move, then the force is doing work. Work and Energy. Work = Force Distance. Work increases the energy of an object. Energy can be converted back to work. Instructor Now pick your pencils up and get this important equation in your notes. Lesson 3 - Understanding Energy (with a Pendulum) Introduction This lesson is meant to introduce energy and conservation of energy and is a continuation of the fundamentals of roller coaster engineering. Chapter 8: Potential Energy and Conservation of Energy. Work and kinetic energy are energies of motion. 1) 0.33 m/s 2. 2) 2 m/s 2. 3) 6 m/s 2. 4) 18 m/s 2 1) 120 J 2) 40 J 3) 30 J 4) 12 J. 1) unchanged. 2) halved. 3) doubled. PHY231 Section 2, Form A March 22, 2012. 1. Which one of the following statements concerning kinetic energy is true? PS-6.2 Explain the factors that determine potential and kinetic energy and the transformation of one to the other. 1 P a g e Work Physics Notes Class 11 CHAPTER 6 WORK, ENERGY AND POWER When a force acts on an object and the object actually moves in the direction of force, then the work is said to be done by the force. STUDY GUIDE 3: Work, Energy, and Momentum. 18. Define power, and use the concept to solve problems involving the rate at which work is done. Physics 2AB Notes - 2012. Heating and Cooling. The kinetic energy of a substance defines its temperature. Physics 2AB Notes - 2012 Heating and Cooling Kinetic Theory All matter is made up of tiny, minute particles. These particles are in constant motion. The kinetic energy of a substance defines its temperature. Energy - Key Vocabulary Term Potential Energy Kinetic Energy Joules Gravity Definition The energy an object possesses due to its position. PE = mgh The energy an object possesses when it is in motion. Lecture Outline Chapter 5. Physics, 4 th Edition James S. Walker. Copyright 2010 Pearson Education, Inc.
2.1 Force and Motion Kinematics looks at velocity and acceleration without reference to the cause of the acceleration. Curso2012-2013 Física Básica Experimental I Cuestiones Tema IV. Trabajo y energía. 1. A body of mass m slides a distance d along a horizontal surface. How much work is done by gravity? A) mgd B) zero C) mgd D) One cannot tell from the given information. E) None of these is correct. 2. Name Class Date. You do twice as much work. b. You lift two identical books one meter above the ground. Kinetic Energy (A) stays the same stays the same (B) increases increases (C) stays the same increases (D) increases stays the same. 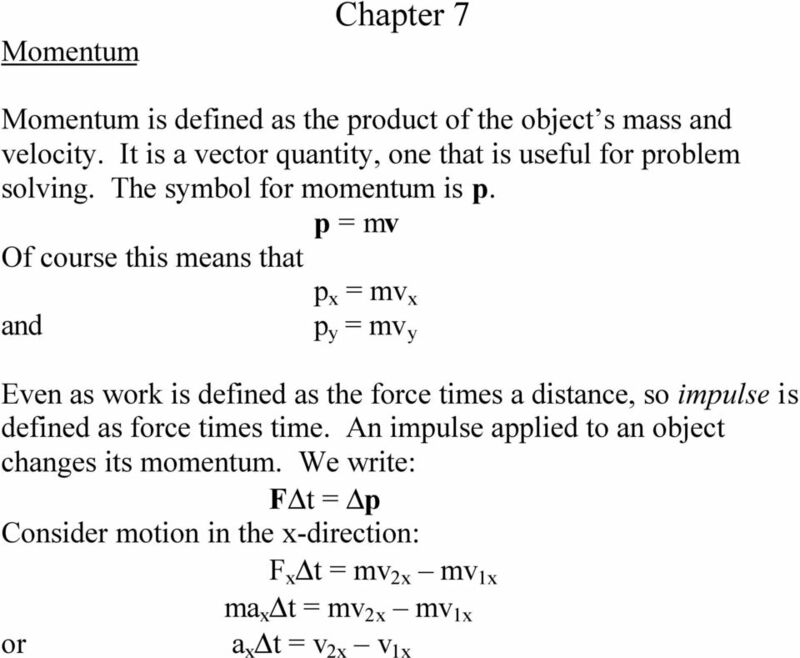 Chapter 4 Newton s s Laws: Explaining Motion Newton s Laws of Motion The concepts of force, mass, and weight play critical roles. A Brief History! Where do our ideas and theories about motion come from?! ch 15 practice test Multiple Choice Identify the letter of the choice that best completes the statement or answers the question. Modified True/False Indicate whether the statement is true or false. If false, change the identified word or phrase to make the statement true. Work, Power, Energy Multiple Choice PSI Physics Name Multiple Choice Questions 1. A block of mass m is pulled over a distance d by an applied force F which is directed in parallel to the displacement. Name: Partners: Period: Coaster Option: 1. In the space below, make a sketch of your roller coaster. Chapter #7 Giancoli 6th edition Problem Solutions ü Problem #8 QUESTION: A 9300 kg boxcar traveling at 5.0 m/s strikes a second boxcar at rest. The two stick together and move off with a speed of 6.0 m/s. FORCES AND MOTION UNIT TEST. Multiple Choice: Draw a Circle Completely around the ONE BEST answer.